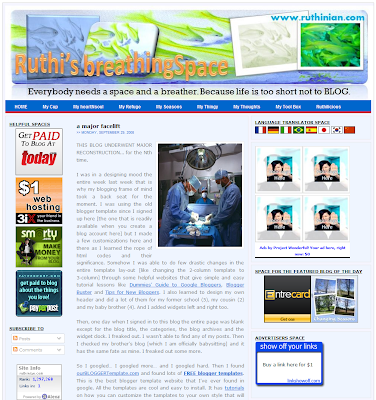 We chose Ruthi's Breathing Space as the 2nd winner of our 2nd contest because of the clean use of our template with good design changes, great story in promoting Ourblogtemplates.com in the entry post, and strong support in Ourblogtemplates. THIS BLOG UNDERWENT MAJOR RECONSTRUCTION... for the Nth time. I was in a designing mood the entire week last week that is why my blogging frame of mind took a back seat for the moment. I was using the old blogger template since I signed up here [the one that is readily available when you create a blog account here] but I made a few customizations here and there as I learned the rope of html codes and their significance. Somehow I was able to do few drastic changes in the entire template lay-out [like changing the 2-column template to 3-column] through some helpful websites that give simple and easy tutorial lessons like Dummies’ Guide to Google Bloggers, Blogger Buster and Tips for New Bloggers. I also learned to design my own header and did a lot of them for my former school (5), my cousin (2) and my baby brother (4). And I added widgets left and right too. Then, one day when I signed in to this blog the entire page was blank except for the blog title, the categories, the blog archives and the widget clock. I freaked out. I wasn’t able to find any of my posts. Then I checked my brother’s blog [which I am officially babysitting] and it has the same fate as mine. I freaked out some more. So I googled… I googled more… and I googled hard. Then I found ourBLOGGERTemplate.com and found lots of FREE blogger templates. This is the best blogger template website that I've ever found in google. All the templates are cool and easy to install. It has tutorials on how you can customize the tamplates to your own style that will suit your personality and taste. They have tips that you can use to enhance and improve your lay-out.And they have updates on everything about blogger. In other words... ourBLOGGERtemplate.com rocks... to the max. And so, I downloaded tons of templates [I have lots of blogs of my own and more adopted ones, remember?] and decided that it’s about time to make a change. Why not? Even Obama is calling for change, right? And I did. And this is the result of that drastic decision I made last week. It was painstaking but worth it. I single-handedly copied all the important data in notepad especially my friends’ blogroll [that task almost killed me] and re-installed them one by one. So, all of my 4 blogger accounts – a Carpenter's WIFE's tool box, My REFUGE, sa puso at isip and THIS ONE… had major facelifts courtesy of ourBLOGGERTemplate.com, now I need one myself… literally. Thanks a lot. This award is well appreciated. I am very honored to receive such recognition. Not bad for a newbie and an html dummy. hahahaha. Thanks again and my best regards to you all. It's really great to have a contest like this for the developers of different kinds. It encourages them to work more and come up with results of great quality. There is nothing better to consider as an option to increase the competing level that offering a contest and such a mood let the participants go beyond their limits to reach out to the top performance. I'm working for a professional resume writing service known as ResumePlus.us and I can see how the competition level is working in the job market among the candidates during various processes of interviews. Anyway, I wish to congratulate the winners and hope to see many more competitions of this kind. Everything is very open with a clear description of the http://123essay.org/essayshark-com-review/ challenges. It was really informative. The share your really gives us a deep awareness on this particular topic. Thanks for your sharing. If you feel tired at work or study try to participate in our games to bring the most exciting feeling. Students Assignment Help provides the best assignment help services for Students. Our expert team is available any time to help in all academic writings like Dissertation Writing, Essay assignment Help, course work, Assignment Help. Assignmenthelpexperts.com assure you that you will get excellent grades and never feel unhappy. We provide cost-effective services and give discounts.